As 2010 draws to a close it comes time to pick my blogging project for 2011, and I’ve decided to return to writing about my kids. Wait! It’ll be a bit different than before. 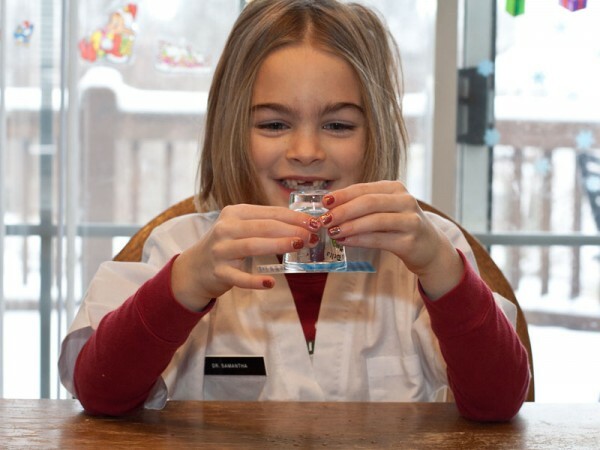 One of the Christmas gifts I bought Samantha this year was a book containing a bunch of science experiments for kids. All the experiments are pretty simple and can usually be accomplished with stuff you can dig out of the trash and junk drawers. I also bought Sam a white lab coat with a name tag reading “Dr. Samantha” –because hey, you have to look the part. Over ninety percent of science is just looking dapper. To round things out, she also got a journal and a sparkly pen –again, science demands fashion sense– to take notes about the experiments and write up the results. The goal this year is to do one of these experiments with Sam each week and then to write about it. One of the reasons I’m doing this is to help teach Sam about science in general and the scientific method in specific. You know, a good foundation for a mad scientist girl genius. When she finally gets her weather control machine working and starts making demands of the world’s governments, you’ll know who to thank. Some of the finer points may be missing, but it’s good enough for a six year old. In addition to learning the fundamentals of science, having her write in the journal should have the added benefits of getting her to practice her penmanship and translating her thoughts into words. 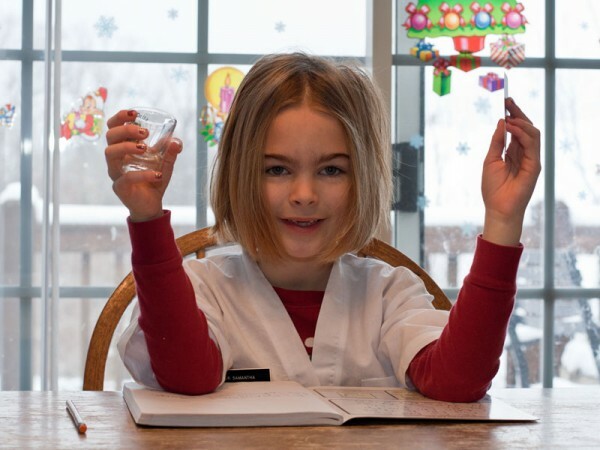 Future mad scientist in training. For example, consider Experiment #1, which had to do with air pressure. 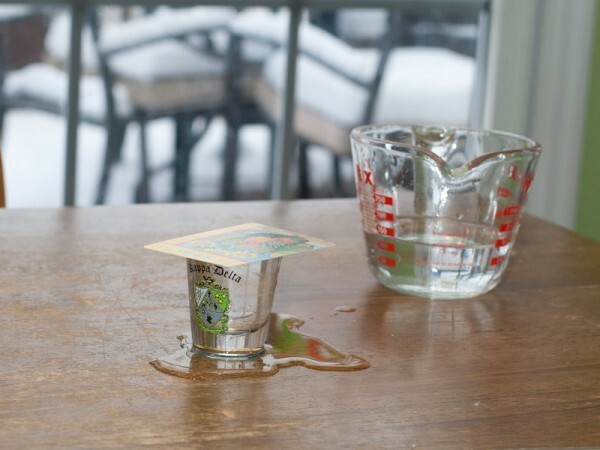 I explained that I was going to take a shot glass, fill it to the tip-top with water, place a playing card on top, then flip the glass and card upside down before letting go of the card and holding the glass in the air a foot above the table. Today's science experiment brought to you by Kappa Delta sororoty. I think it will spill out. What hopind: The card stayed up. So, like I said, I’m starting off simple but I hope that Sam keeps her interest level up so that I can task her with writing more detailed predictions and explanations for why she predicts what she does. Next week: we grow mold! Who doesn’t like mold? Doesn’t surface tension factor in here too? I don’t get how the air pressure Alone can counteract the heavier water otherwise. Yeah, surface tension is in play as well, but I decided to keep it straight forward. I think most of it is due to air pressure. Heh, nothing yet. I’m still cautious about the experiments involving fire, though. Love this. Of course I’m always saying that science and magic ain’t that far off. Figure out the rules of magic > rename as “science” > fun and profit! Jamie, I was wondering if you can share the name of the book you are using, this seems like such a wonderful thing to do with your daughter. There are tons of books out there like this (and probably websites, too) but the one I’m using is 101 Great Science Experiments. I liked it because it had a lot of really simple experiments that you can do without buying special materials.